Kick off your visit on the 18th (Mon): take in the pleasant sights at Central Park. To find more things to do, traveler tips, ratings, and tourist information, read our New York City trip itinerary builder . Sao Paulo, Brazil to New York City is an approximately 14-hour combination of flight and bus. You can also fly; or do a combination of bus and flight. Traveling from Sao Paulo to New York City, you'll gain 2 hours due to the time zone difference. Prepare for colder weather when traveling from Sao Paulo in February: high temperatures in New York City hover around 9°C and lows are around -1°C. 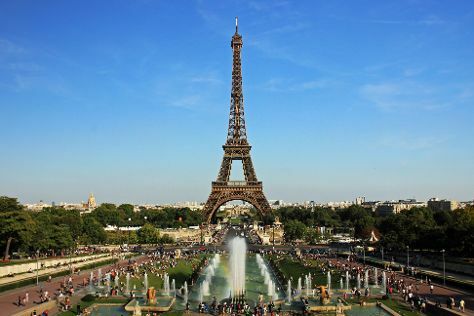 On the 18th (Mon), wrap the sightseeing up by early afternoon so you can travel to Paris. Palace of Versailles and Eiffel Tower will appeal to history buffs. Get some cultural insight at Cathédrale Notre-Dame de Paris and Basilique du Sacre-Coeur de Montmartre. 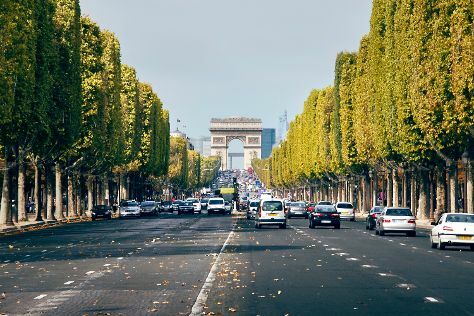 There's lots more to do: admire the landmark architecture of Arc de Triomphe, don't miss a visit to Pere-Lachaise Cemetery (Cimetiere du Pere-Lachaise), stroll around Luxembourg Gardens, and wander the streets of Saint Germain des Pres Quarter. To find ratings, where to stay, maps, and tourist information, read our Paris day trip app . Do a combination of bus and flight from New York City to Paris in 12 hours. Alternatively, you can fly; or do a combination of bus, flight, and train. The time zone difference moving from Eastern Standard Time (EST) to Central European Time (CET) is 6 hours. In February, daytime highs in Paris are 9°C, while nighttime lows are 1°C. You'll set off for London on the 22nd (Fri). Kick off your visit on the 22nd (Fri): explore the world behind art at National Gallery and then explore the world behind art at The British Museum. Here are some ideas for day two: make a trip to Big Ben, ponder the world of politics at Houses of Parliament, contemplate in the serene atmosphere at Westminster Abbey, then explore the world behind art at Victoria and Albert Museum, then make a trip to Tower of London, and finally take in the architecture and atmosphere at St. Margaret Lothbury Church. To find more things to do, ratings, reviews, and more tourist information, refer to the London trip itinerary tool . Take a train from Paris to London in 2.5 hours. Alternatively, you can fly; or drive. The time zone changes from Central European Time (CET) to Greenwich Mean Time (GMT), which is usually a -1 hour difference. In February, daily temperatures in London can reach 9°C, while at night they dip to 1°C. Finish your sightseeing early on the 24th (Sun) so you can take a train to Paris. Kick off your visit on the 25th (Mon): admire the landmark architecture of Church of Saint-Germain-des-Pres, head off the coast to Île de la Cité, examine the collection at Musee de l'Orangerie, get a taste of the local shopping with Champs-Elysees, then wander the streets of Montmartre, and finally explore the world behind art at Centre National d'Art et de Culture George Pompidou. On your second day here, wander the streets of Le Marais, stroll the grounds of Pantheon, contemplate the long history of The Catacombs of Paris, then see the interesting displays at Musee Rodin, and finally take in the views from Pont Alexandre III. For traveler tips, reviews, more things to do, and more tourist information, go to the Paris holiday builder tool . You can take a train from London to Paris in 2.5 hours. Alternatively, you can fly; or drive. The time zone changes from Greenwich Mean Time (GMT) to Central European Time (CET), which is usually a 1 hour difference. You will have some time to spend on the 27th (Wed) before leaving for New York City. For where to stay, traveler tips, maps, and other tourist information, read our New York City holiday planner. Getting from Paris to New York City by combination of flight and bus takes about 12 hours. Other options: fly; or do a combination of train, flight, and bus. Due to the time zone difference, you'll gain 6 hours traveling from Paris to New York City. Traveling from Paris in February, New York City is a bit cooler at night with lows of -1°C. On the 27th (Wed), you're off toMontreal. Notre-Dame Basilica and Saint Joseph's Oratory of Mount Royal are good opportunities to explore the local culture. Nostra Madonna della Difesa and Avenue McGill College will appeal to history buffs. 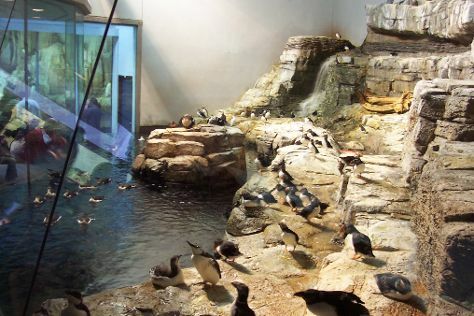 There's much more to do: admire the masterpieces at The Montreal Museum of Fine Arts (Musee des Beaux-Arts), learn more about the world around you at Biodome de Montreal, take in nature's colorful creations at Montreal Botanical Garden, and make a trip to Old Montreal. To find reviews, maps, ratings, and tourist information, go to the Montreal trip planner . Traveling by flight from New York City to Montreal takes 5 hours. Alternatively, you can fly; or drive. When traveling from New York City in February, plan for cooler days in Montreal, with highs around -4°C, while nights are slightly colder with lows around -12°C. On the 3rd (Sun), you're off toNew York City. Get some historical perspective at 9/11 Memorial and St. Patrick's Cathedral. Museum-lovers will appreciate The Metropolitan Museum of Art and American Museum of Natural History. See some other sides of New York City: make a trip to Central Park, pause for some serene contemplation at Saint Patrick’s Cathedral, explore the galleries of Ellis Island, and pause for some photo ops at Statue of Liberty National Monument. You can fly from Montreal to New York City in 5 hours. Alternatively, you can fly; or drive. Expect somewhat warmer temperatures when traveling from Montreal in March; daily highs in New York City reach 11°C and lows reach 1°C. Cap off your sightseeing on the 6th (Wed) early enough to travel to Washington DC. On the 7th (Thu), take in the spiritual surroundings of Basilica of the National Shrine of the Immaculate Conception, steep yourself in history at Georgetown University, contemplate in the serene atmosphere at Washington National Cathedral, then explore the different monuments and memorials at Arlington National Cemetery, then see the interesting displays at National Air and Space Museum, and finally appreciate the history behind Vietnam Veterans Memorial. Get ready for a full day of sightseeing on the 8th (Fri): get to know the fascinating history of Tomb of the Unknowns, see the interesting displays at United States Holocaust Memorial Museum, and then explore the world behind art at National Gallery of Art. To see reviews, maps, other places to visit, and tourist information, go to the Washington DC trip itinerary builder website . You can fly from New York City to Washington DC in 3.5 hours. Alternatively, you can take a train; or drive. While traveling from New York City, expect a bit warmer days and about the same nights in Washington DC, ranging from highs of 15°C to lows of 3°C. Finish up your sightseeing early on the 8th (Fri) so you can travel to Columbia. To find maps, where to stay, ratings, and other tourist information, read our Columbia trip itinerary planning website . Getting from Washington DC to Columbia by flight takes about 3 hours. Other options: do a combination of subway, bus, and flight; or drive. Prepare for a bit warmer weather when traveling from Washington DC in March: high temperatures in Columbia hover around 22°C and lows are around 7°C. You'll set off for Orlando on the 9th (Sat). Kick off your visit on the 9th (Sat): explore the world behind art at Charles Hosmer Morse Museum of American Art, then admire the masterpieces at Cornell Fine Arts Museum, then take in the exciting artwork at Timothy's Gallery, and finally pause for some serene contemplation at St James Roman Catholic Cathedral. You can drive from Columbia to Orlando in 7.5 hours. Alternatively, you can take a train; or take a bus. Plan for somewhat warmer temperatures traveling from Columbia in March, with highs in Orlando at 30°C and lows at 17°C. Finish your sightseeing early on the 11th (Mon) to allow enough time to drive to Miami. On the 11th (Mon), see the interesting displays at Vizcaya Museum and Gardens, kick back and relax at South Beach, then take a stroll through Art Deco Historic District, and finally don't miss a visit to Bayside Marketplace. On the next day, tour the pleasant surroundings at Fort Lauderdale Beach, kick back and relax at Hollywood Beach, and then wander the streets of Lincoln Road. To find other places to visit, reviews, maps, and other tourist information, refer to the Miami trip maker site . Getting from Orlando to Miami by car takes about 4 hours. Other options: take a bus; or take a train. Traveling from Orlando in March, you can expect nighttime temperatures to be somewhat warmer in Miami, with lows of 21°C. On the 13th (Wed), you'll travel back home.